with the help of photos. Spring is in the air! 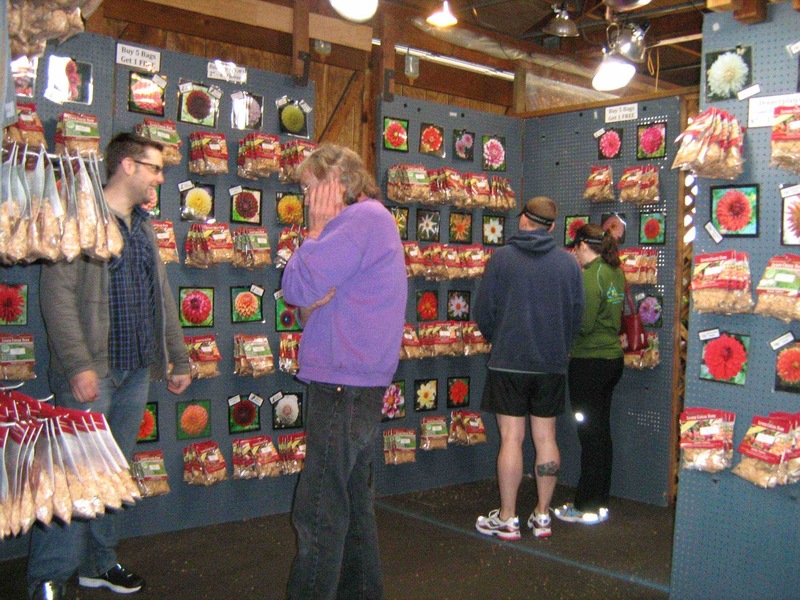 One of the surest signs of spring is the opening of the Olympia Farmers Market. After its annual three-month closure, the market's opening bell will ring on Thursday, April 4. 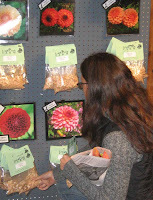 And Lynch Creek Farm will be there with its beautiful booth full of healthy dahlia tubers, all ready for planting. So many dahlias... how to choose? Dahlias are among the easiest flowers to grow, and easily the most satisfying of flowers. Those dahlia tubers, which look for all the world like off-color sweet potatoes (potatoes are tubers too, come to think of it) contain the promise of a fast-growing garden plant that will, within a few short months, grow into a full-fledged fountain of flowers. Dahlias bloom from July until the first frost, so there's a good long flower season for this sweetheart plant. 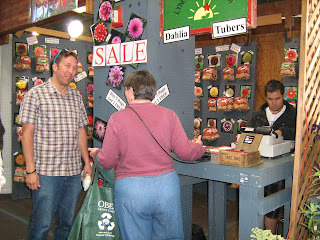 You can, of course, buy dahlia tubers online at the Lynch Creek Farm website. 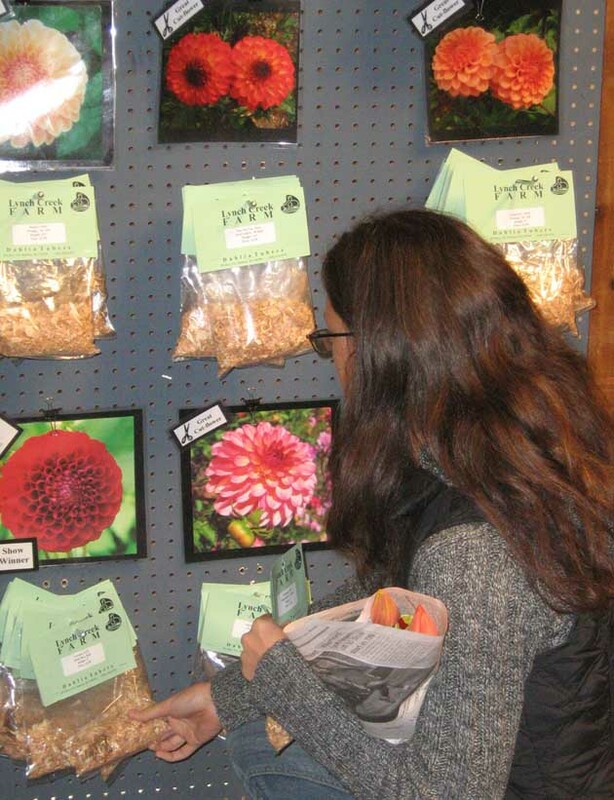 But at the market, you'll get the benefit of one-on-one help and advice on growing dahlias from one of the staff who knows the ins and outs of growing dahlias. Farmers Market is colorful and tempting. 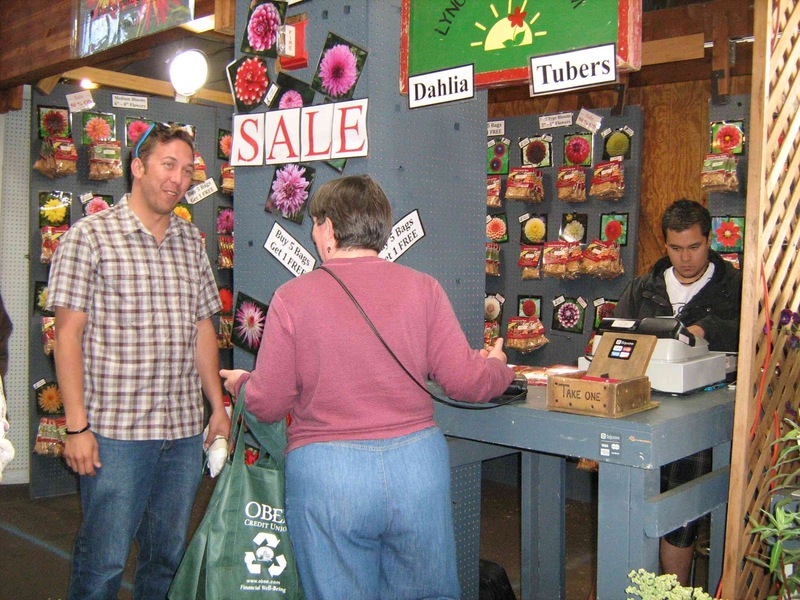 If you live in the South Puget Sound area and you haven't visited the Olympia Farmers Market recently, make it a must-do this spring. You'll find everything from bouquets of tulips and daffodils to the season's first produce, artisan cheeses, fresh and cured meats, incredibly fresh fish and oysters, plant starts, baked goods, handmade soaps, and arts and crafts ranging from hand-turned wooden bowls to handmade paper to paintings, jewelry and leather goods. A row of food vendors offers meals on the go, a covered table area offers shelter in case of rain or hot sun, and there's live music almost continuously at the market at the north end of Capitol Way in downtown Olympia. And of course, there's that wonderful Lynch Creek Farm booth with all those dahlia tubers. That's another sure sign of spring!